Organic crystals are generated via the bottom-up self-assembly of molecular building blocks which are held together through weak non-covalent interactions. Although they revealed extraordinary charge transport characteristics, their labile nature represents a major drawback towards their integration in opto-electronic devices when the use sophisticated patterning techniques is required. Here we have devised a radically new method to enable the use of photolithography directly on molecular crystals, with a spatial resolution below 300 nm, thereby allowing the precise wiring-up of multiple crystals on demand. Two archetypal organic crystals, i.e. p-type diphenylbenzothieno[3,2-b]benzothiophene (Dph-BTBT) nanoflakes and n-type N,N′-dioctyl-3,4,9,10-perylenedicarboximide (PTCDI-C8) nanowires, have been exploited as active materials to realize high-performance top-contact organic field-effect transistors (OFETs), inverter and p-n heterojunction photovoltaic devices supported on plastic substrate. 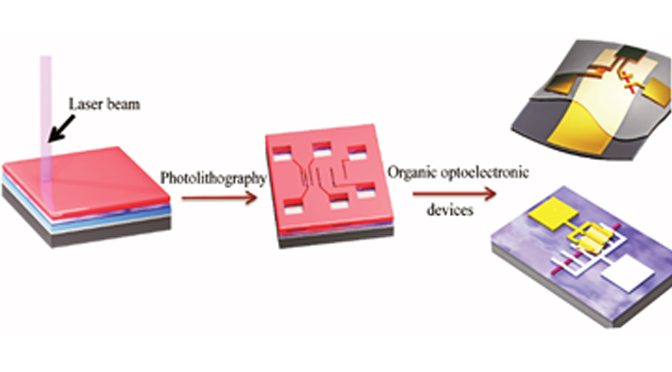 The compatibility of our direct photolithography technique with organic molecular crystals is key for exploiting the full potential of organic electronics for sophisticated large-area devices and logic circuitries, thus paving the way towards novel applications in plastic (opto)electronics.